Now that my garage is framed and drywalled, I’m starting to look at the fun stuff: What colors to paint the walls and what is the best paint for garage walls? I’m really glad I started thinking about this before I got to the hardware store. As I was doing my research, I found out that there are garage wall paint options that sound like a great idea at first, but they can actually be costly mistakes that you’ll need to deal with later. Some even pose a safety threat to your family. What is the best paint for garage walls? You’re going to want a latex, interior wall paint with either a semi-gloss or satin sheen. 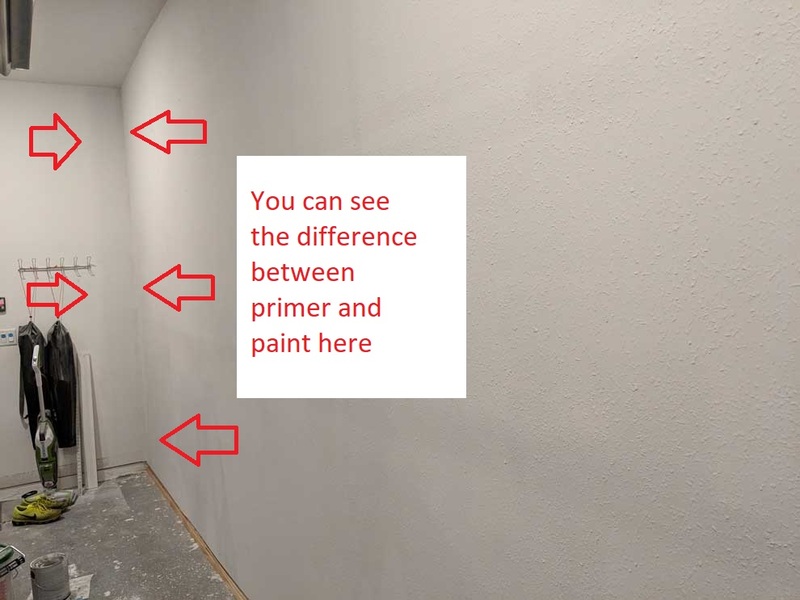 It’s important to also use primer on your walls before you paint, whether you’re painting over drywall or exposed concrete block. That’s the simple answer, but there’s a lot to digest in there. Let’s take a look at each part individually so you can make the right paint choice for your garage walls. Should I use interior or exterior paint for garage walls? There’s a lot of misinformation out there in forums and other blogs, so we’re going to address this first. Even if you don’t listen to anything else I say, it’s important to get this one right because this is a safety risk to you and your family. Never use exterior paint inside your home – even in your garage. That’s coming straight from the Environmental Protection Agency (EPA) guidelines and from cases reported to the Center for Disease Control (CDC). Not to mention it’s the same information that the paint companies will tell you on their websites. Exterior paints can contain higher concentrations of toxic chemicals, like fungicides. Outside, the fumes from the paint will dissipate more rapidly so they’re not as harmful to humans and pets. Indoors, where the air is recirculated over and over, there’s nowhere for the toxic fumes to go…except your lungs. Most people think about using exterior paint on their garage walls because it is more resistant to scuffs, stains, scratches and mold. But there are many interior paints that have similar characteristics without posing a health risk to your family. What type of paint do you use in the garage? Paint comes in two major types: latex (water-based) or oil based paints. Which is right for your garage? This is somewhat based on your personal preference, but I’m going to explain why I recommend a latex paint instead of oil. Similar to the interior\exterior paint question above, latex paints will emit lower levels of chemical vapors and less toxic chemicals overall, so they’re safer to use. If you’ve got small children, there’s less of a health risk if one of your little ones accidentally swallows some of your garage wall paint. Before you start with the angry comments down below…I said “less of a risk.” There’s still going to be vomiting, headaches and general nausea, but the vapors in oil based paints can actually cause pneumonia. Throw in that latex paints can be cleaned up with soap and water, and is less irritating to your skin if when you get some on you, latex paint becomes the clear choice. Do I need to use drywall primer? If you’ve followed along with my garage renovation plan, you’ve also got drywall that’s been mudded, sanded and cleaned that is ready for paint. Not so fast…you NEED at least one coat of dedicated primer – not a paint-and-primer-in-one. Many companies will sell a combination paint and primer. That may be fine for your other walls, but not for your garage. If you’re repainting your living room wall, for example, you’ve already got at least one cost of paint that you’re covering up. Underneath that, there’s a layer of primer that helps make a consistent surface for the paint to adhere to. That’s a lot of layers underneath the paint you’re adding. Each one of those layers is doing a little bit to help smooth out the paint surface. Without them, the drywall would just soak up the paint much differently than the drywall mud. 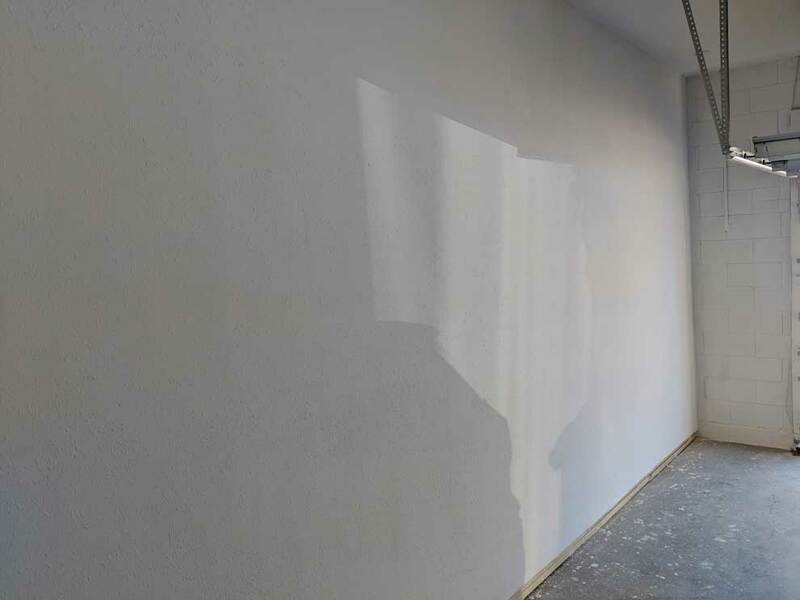 Primer will seal the drywall paper and allows the top-coat to bind to the surface. Let me illustrate: Take your fingertips and run them over your new drywall and over some of the seams that you’ve smoothed out with drywall mud. Feel the difference in texture? The garage wall paint is going to adhere to the bare drywall differently than it will to the mud. If you really want to see this in action, take a small section of your wall (no more than one square foot) and paint it without a base coat of primer. You’ll still be able to see the difference between the drywall and the mud. Trust me. Take the little extra time to add a dedicated primer coat. You’ll save a lot of time and money in the end. I went with a primer that was slightly-off white when it dried, so it was easy to tell where I’d already painted and what still needed to be done. How about painting unfinished garage walls? So an unfinished garage then would be either bare concrete block or plywood. Plywood walls: If you’ve got plywood walls over bare studs, then I wouldn’t not recommend painting the bare plywood. No matter how many coats of paint you apply, it’s not going to look professional. It’s going to look like painted plywood. Spend and afternoon and a little bit of money and add some batt insulation and drywall. It’s going to look better and be more comfortable in the long run. Concrete walls: If you’ve got concrete block garage walls and you’re happy with that, this is going to be really easy for you. I wrote a tutorial on how you can use Drylok to waterproof your garage walls. Drylok goes on thicker than normal latex paint, and it’s more expensive as well. But, you can tint Drylok so that it acts as both a waterproofer and a paint. One step and you’re done. What kind of finish do you use for garage wall paint? This is where we talk about satin vs eggshell vs semi-gloss, which is you’re a brand new homeowner shopping for paints for the first time, it can be pretty intimidating. You’re going to hear terms like gloss and sheen thrown around and wonder what the difference is. The short answer is they’re both slightly different measures of the amount of light reflected off the paint. If you really want to get into the weeds on the difference, Sherwin-Williams has a great article that goes into all the details. For our discussion, we can use them almost interchangeably. How stain resistant do you need the walls to be? How many imperfections are on the walls? Garages are extremely high-traffic areas. I mean…it’s the only place in your house where you will have actual traffic (your car). If you use your garage as a workshop as well, that just further ups the level of abuse that your walls are going to suffer. Think about it: your car’s exhaust, road dust, wood shavings from a table saw, lawn clippings from your lawnmower or trimmer…the list goes on. A higher gloss paint has a tougher and more stain-resistant finish. That’s why most kitchens and bathrooms are painted with semi-gloss paint. A higher gloss paint will also reflect more light back at you…which shows off every little imperfection on the surface of the wall. Unless you’ve been smoothing and sanding your drywall mud until it’s the consistency of butter, you probably want to stick with a lower gloss paint. One other thing to consider is how much light you have in your garage. If you have a good amount of light, you can get by with a lower sheen paint. But if you have a fairly dark garage, opt for a higher-gloss paint and maybe look at additional garage lighting. Originally when I wrote this article, I recommended a semi-gloss paint. After seeing how it looked on my walls, I now recommend a Satin finish for your garage walls.